Apache Hive:- It is a data warehouse infrastructure built on top of HDFS and MapReduce(HDFS provides distributed storage and MapReduce is execution model) and facilitates querying & managing large datasets residing in distributed storage.It provides an SQL-like language called HiveQL which transparently converts queries to map/reduce, Apache Tez and Spark jobs. It allows programmers to plug in their custom mappers and reducers for sophisticated analysis that may not be supported by the built-in capabilities of the language. Apache hive does not restrict for any particular file format, works equally well with even customized file format. 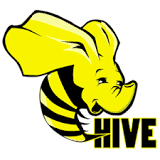 Read more about Apache hive here and a nice discussion about it. The main agenda of this post is to set-up hive in Linux(Ubuntu) already having hadoop setup running and execute SQL like query in hive environment.Since apace Hive built on top of Apache Hadoop, hadoop setup is prerequisite for running Hive. Step 1:- Download stable release of Hive from here. I have downloaded apache-hive-1.2.1-bin.tar.gz, and unzip it, unzipped folder it creates is apache-hive-1.2.1-bin. Step 3:- Open bashrc file and update it with following entries. Step 3:- Start hadoop services.Hive internally uses hdoop(or other computation engine too). Here we are relying on hadoop. Execute following command to create two directories. Note:- Above command executed from hduser1 context, since I have installed hadoop under user hduser1. Step 5:- Hadoop is installed in the context of user hduser1,give write permission to other users so that hive query can be executed from other user context. Execute following command for the same. Step 6:- Start apache Hive prompt, just type hive in terminal and press enter. java.lang.IncompatibleClassChangeError: Found class jline.Terminal, but interface was expected"
Reason behind it is Hive has upgraded to Jline2 but jline 0.94 exists in the Hadoop lib. Solution:- Execute following command in terminal followed by hive shell command. Refer this for more error and resolution in Hive. 2. Press Ctril + C to exit form Hive prompt and return to terminal. HiveQL is a dialect of SQL,heavily influenced by MYSQL. Although, SQL does not provide a solution for all big data problems but it provides an efficient and powerful tool to analyst with strong SQL background and mere Java knowledgeto for analysing high volume of data. Internally, HiveQL is translated into series of MapReduce job or other jobs depending on property name "hive.execution.engine.property" configured. Other possible execution engines that can be used are Apache Tez, Spark. Hive Shell and interaction with Hive:- Start Hive shell (Just type hive in terminal and press enter), First create a new schema (database), get inside it(use that schema) and followed by create a table. Above table creation query is nothing more than a plain SQL query. Since, the main purpose of using Hive is to deal with high volume of data(log files,retails/sells data,forecasting data) and analyse these raw data with HiveQL,which usually done by writing mapreduce programs. Lets create a table employee and load data in it from a text file followed by execute HiveQL query on employee table. Above create table query creates a table employee with 3 column and ROW FORMAT clause tells Hive that each row in the data file is | (pipe-delimited) text. Hive expects there to be three fields in each row, corresponding to the table columns, with fields separated by | (pipe) and rows by newlines. Load DATA ... query tells Hive to put the specified local file(employee_record.txt) in its warehouse directory named employee (Remember, Hive does not mandate any particular file format so whatever file input will be provided it will be simply copied to warehouse directory, even if it does not matches definition of table columns, if there is any mismatch it will appear while querying). OVERWRITE keyword wipe out existing files in warehouse and add the specified one. 1. Along with normal text files we can also load Map file,JSON files in warehouse directory and analyses using known UDF(user defined function) - get_json_object, json_tuple, JSON SerDe. 2. If no schema name is specified(if we do not execute use retails and try to create table), table is created in default schema. 3. Hive creates one directory for each table under /user/hive/warehouse, execute following command outside hive shell and see the directory structure. 4. Interactive VS non-interactive mode:- Until now we executed queries in Hive shell and result displayed at same place, this mode of execution is termed as interactive mode execution. With -f option we can run hive shell in non-interactive mode and here we specify SQL in a script file.Create a script file say,script.hive and copy following SQL query in that file. From terminal execute following command- execute script file in non-interactive mode in Hive. By default,tables created in Hive are managed by Hive - On executing LOAD ... query, Hive moves data(files) in warehouse directory of that table and deletes data & metadata on executing Drop command.As shown earlier following commands creates table and copy file in warehouse directory. On executing Drop command - data along with metadata are deleted. Hive provides flexibility to creates an external table and allows user to manages data itself.While creating external table - location of external table is specified and Hive does not care whether location specified exist or not(Even if location does not exist, table will be created successfully). While executing drop command, only metadata is wiped out not actual data.This feature allows data creation lazily after creating table. Here we have created external table(External Keyword) and loaded data locally. Since it is external table no file is copied by Hive in table location "/tmp/hive/externalTable"(as contrast to earlier table creation associated with data file copying in warehouse directory). A table's definition can be changed after table has been created- table directory structure can be changed(External table underlying directory cannot be changed). New column can be added but data associated with it cannot be updated(Hive does not allow updating existing record, instead always recommended to create new table with columns and populate it with select statement). Using Drop command data and metadata both wiped out in managed tables and only metadata data is wiped out in external table.In managed tables, using Truncate command we can keep definitions of table and delete data of table. Truncate does not work with external tables, instead we need to use dfs -rmr to remove external table directory. FAILED: SemanticException [Error 10146]: Cannot truncate non-managed table external_customers. Create a table with same schema as another existing table using Like keyword. Solution: Do verify Hadoop services are running. Go to <Hadoop_Home>/sbin/ and execute ./start-all.sh. Solution:- Hive has upgraded to Jline2 but jline 0.9x exists in the Hadoop lib.Execute following command in terminal before executing Hive.